I know I've blogged about getting these two masks before but I've never really wrote about my thoughts on them so I decided to write a review for them for anyone who is interested in trying these masks out. I really like and trust the brand My Beauty Diary. It's not too expensive for a daily use mask and it works great on the skin. There are many different type of masks from this brand and each mask pertains to have different use for the face. There are ones for moisturizing, firming, whitening, lift stretch, cooling and etc. Awhile back, I had a chance to try many different masks from this brand because a friend of mine gave me a bag of different masks from this brand to try. However, I have to say my ultimate two favourite masks from this brand is the Black Pearl Mask and the Strawberry Yogurt Mask. The Black Pearl Mask is a best seller from the brand and it softens and whitens skin while bringing back its original resilience and glow. It is recommended for normal skin types to improve skin elasticity. The main purpose of this mask is whitening and nourishing. It also restores elasticity and luster. Natural vitamin C plan extracts such as pineapple, lime, cucumber stimulates metabolism of cuticles, thereby removing old and dead skin cells, making your skin silky smooth, refreshed and white. Furthermore, it enhances elastcity, luster and vitality, ultimately creating the perfect clear and elastic skin. This mask really does leave my skin feeling more refreshed, white and smoother when I use it. I really do see a difference in my skin from before and after I used the mask. It also adds a very healthy glow to my skin making it look really soft and smooth. Overall I'd give the mask a 5/5. 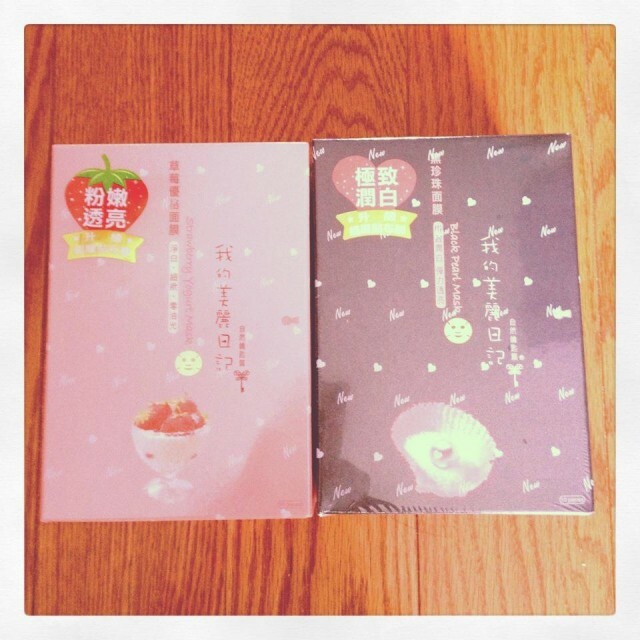 The Strawberry Yogurt Mask is mainly used for oil control and balancing. It is suitable for normal skin type and especially recommended for oily skin combinations. It is used to increase the moisture and softness of the skin. Mallow extracts combined with the blink-lock water efficiency element y-PGA standard poly acid form a layer of moisture on the skin, keeping skin moist, lustrous, fresh and bright. Just like the sweetness of the strawberry and the smoothness of yogurt, every inch of your skin will be beautifully transformed! As mentioned above, this mask is mostly used for oil control and balancing but it also helps to brighten the skin. I don't have oily skin but I am oily around the t-zone of my face especially my nose, forehead and eyebrow area. So I like to use this mask to help keep my oil control on those spots and I do find that this mask makes my skin look a bit brighter after I use it. It also moisturize my face and makes my skin feel extra smooth and fresh. Overall I'd give this mask a 4/5. It doesn't leave my skin looking as nice as the Black Pearl Mask but it's definitely a great mask to use for moisturizing the skin and especially during the colder weather in fall/winter. I rotate from using these two masks once every week and I try to do a mask every week if I'm not on my period. Whenever I am on my period, I tend to break out with pimples and I fear that putting a mask on will break me out even more so I usually skip doing mask on the week when I have my period.